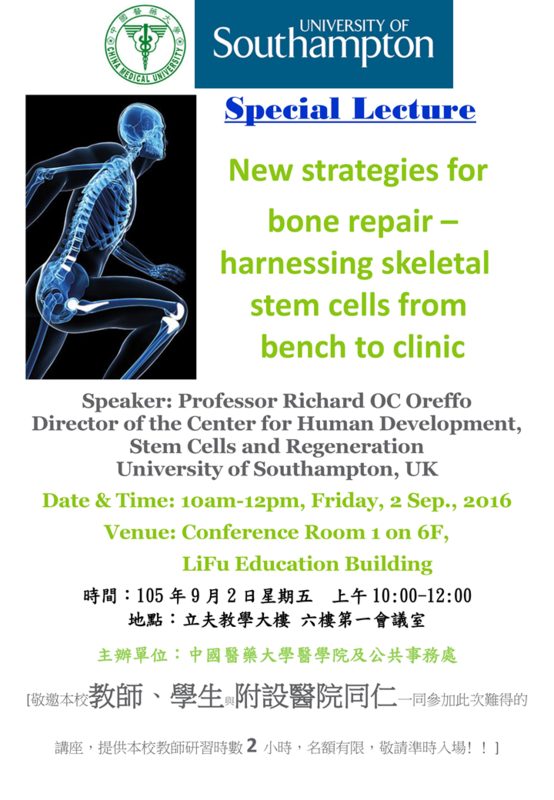 With special thanks to great efforts made by Office of Global Affairs and College of Medicine, China Medical University (CMU) is very honored to have invited Professor Oreffo from UK to deliver a talk regarding his cutting edge technique in clinics - applying skeletal stem cells to facilitate bone repair. CMU gives the warmest welcome to Professor Oreffo's visit this Friday (2nd of September) and look forward to this exciting event and profound discussion that will incur and leave us with great impact. Since more substantial collaboration between CMU and UOS are to be expected in the very nearer future, Professor Oreffo’s contribution is much appreciated and he will also be awarded with Visiting Professorship by College of Medicine. This collaboration or communication will soon be proved to be fruitful and versatile, motivating a wide spectrum of academic exchanges and research interests across from skeleton research, stem cell research to clinical application. Such great opportunity will enable CMU to encourage interactions between research teams, between universities, and between CMU and CMU Hospital. CMU will keep striving to call for a wide range of collaboration that will help to benefit for both sides and push us further! Please kindly contact Joy Liao at Office of Global Affairs to sign up or for more information. Dial Ext. 1613 or email sy.liao@mail.cmu.edu.tw. Thank you.